I’m not the best at keeping cool places a secret. I couldn’t even resist putting a hint in the photo above, but secrecy is exactly what will add to the fun and adventure of the upcoming Lancaster County’s Best Kept Secrets – 12 Shops of Christmas Tour, which is a spin-off of the Best Kept Secrets Tours that are held in the spring and fall. This year’s dates for the holiday version are November 29-December 8.
Credit for the tours goes to Lancaster County native, Melissa Nordhoff, who started them 10 years ago. Through managing her mother’s store, Carson’s in the Cornfield near New Holland, she saw a need for local small businesses to reach more customers. With a background in advertising, Melissa had a unique idea for making shopping more of an adventure. So began the Best Kept Secrets Tour, which didn’t stay secret for very long – they are now held in 15 counties across Pennsylvania, Maryland and Virginia. The 12 Shops of Christmas Tour is slightly smaller than the spring and fall tours, but having taken a sneak peek at the list of stops, believe me, you’re in for some treats. Part of the reason for fewer destinations is that the focus of the Christmas Tours changes every year. This year’s stops cover the Lititz and Ephrata area and include 12 unique shopping experiences and two lovely cafés. Tickets are only $10, and this year, $1 from each ticket sale will benefit Ephrata Area Social Services. When you crack the seal on the tour booklet, which is essentially your ticket, you’ll be privy to almost all the secrets, as it describes each destination and provides a map and schedule of special events. Tour-goers have the option of covering the route in a day’s time or at a leisurely pace, taking in the stops over the course of several days. When you arrive at each destination, be sure to show them your ticket-booklet to reveal more secrets – each participating destination will have special treats and offers for tour-goers. You’ll also find a funny-looking Christmas tree printed on the back of your booklet. There is a spot for each destination to stamp your tree. If you collect stamps from 11 of the 14 participating businesses, you can enter to win a $350 shopping spree. 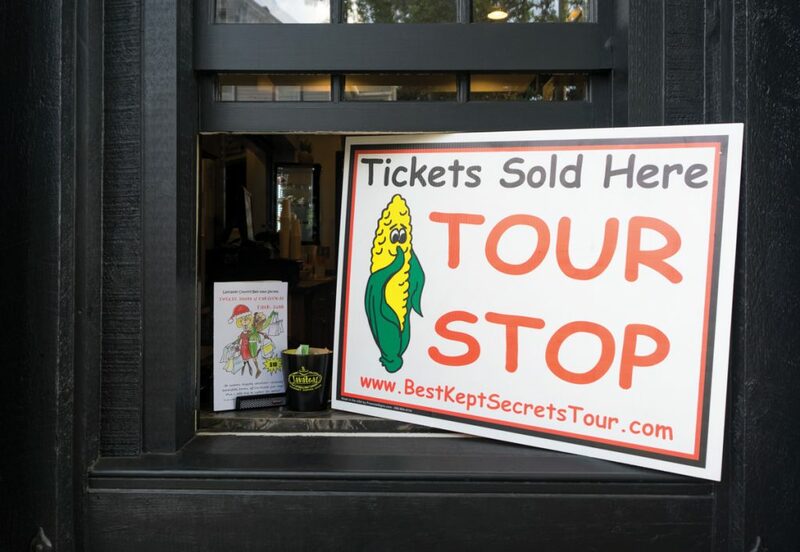 For more information about the Best Kept Secrets Tours, visit bestkeptsecretstour.com or call 717-721-9409. Too excited to wait for the Christmas Tour? You can take in other Best Kept Secret Tours being held this month in Montgomery, Berks, York/Adams and Harford/Cecil counties.